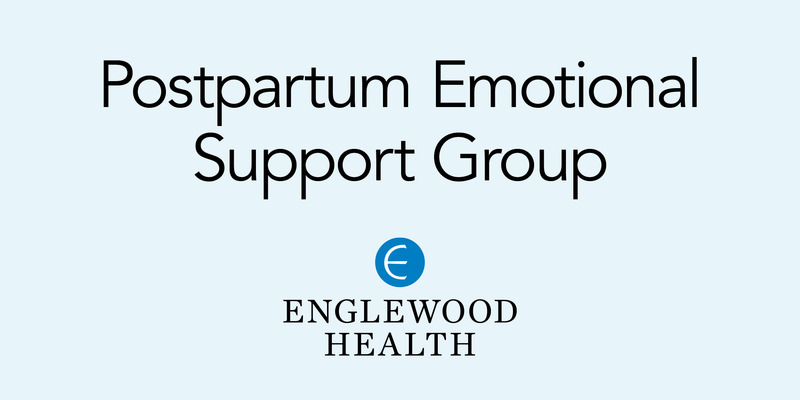 Englewood Health’s Family Birth Place features award-winning maternity care services with the accommodations of a luxury hotel. Our board-certified obstetricians and nurses work with expectant mothers to create an individualized care plan so families meet their labor and delivery expectations. Health and wellness for both mother and baby are a priority, and our comprehensive maternity services – including specialized education and support classes, nutritional support, and access to advanced medical care and our neonatal intensive care unit – make the experience of giving birth the best it can be. Complete and submit the form below to register for access to www.thenewbornchannelnow.com. 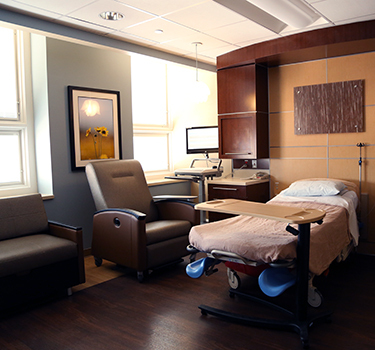 Our Labor and Delivery Unit was designed with comfort and safety in mind. Our eight rooms have in-room music and docking stations, infant resuscitation stations, and private bathrooms. Our unit has two state-of-the-art operating rooms for planned or emergency C-sections. After your baby is born, you and your newborn will be cared for in our beautiful family-centered Mother/Baby Unit, where you will remain for the duration of your stay. For a vaginal delivery, you will likely go home on the second day after the birth of your baby. If you have a C-section, you will likely go home on the third or fourth day after the birth. The suite includes 21 private rooms and 3 semi-private rooms. A sleeper sofa is available for your significant other, a friend, or adult family member. With décor and amenities that rival a luxury hotel, each room features modern furnishings in soothing earth tones, hardwood floors, flat-screen televisions, sleeper sofas, storage space, and upholstered chairs with ottomans. Special attention has also been paid to the lighting, in an effort to eliminate disruptions to mom and baby and provide the appropriate ambience during the day, evening, and feeding times. Ceiling lights are on a dimmer switch and smaller lights have been installed a few inches from the ground near the door and along the walls, to ensure a less intrusive late-night entry by our staff. Our spacious rooms can accommodate the important people in your life who wish to be present for this important occasion. All of this is complemented by the round-the-clock care from our compassionate and knowledgeable nurses and patient care team, who will do everything to ensure you and your family enjoy a comfortable first few days bonding together. Parents can rest easy knowing their baby’s health is in excellent hands through every stage of pregnancy. Our Maternal and Fetal Medicine Center combines medical expertise with advanced technology to diagnose and manage maternal or fetal problems. The center is accredited by the American Institute of Ultrasound Medicine and performs approximately 10,000 ultrasound procedures every year. Your obstetrician will provide you with a referral or preauthorization, which you must present upon registration on the day of your visit to the Maternal and Fetal Medicine Center. You should also contact your insurance company to ensure that Englewood Hospital and our physicians are covered by your plan. For further information about antepartum testing, call 201-894-3669. Our center is staffed with board-certified maternal-fetal medicine specialists, registered perinatal sonographers, pediatric cardiologists, and certified genetic counselors. If necessary, we will connect you with other appropriate pediatric subspecialists prior to your delivery. If you’re at high risk for complications, your obstetrician will work with our specialists to identify those complications, discuss them with you, and begin to coordinate treatment and care plans to ensure the best possible outcome for mom and baby. Drink 1 glass of water 15 minutes before your appointment and do not empty your bladder. Eating is permitted. You will be permitted to bring one person into the exam room during the evaluation. All other visitors may be invited into the exam room once the evaluation is completed. Children are not permitted in the exam room during the test, but will be invited into the exam room upon discussion of results. When you enter the medical center, stop at the information desk to obtain a visitor’s pass. From the information desk you will proceed to the registration department. After registering, take the “B” elevator to the 4th floor. Exit to the left and proceed to room 4213. Bring your prescription, your referral/preauthorization forms(s) (if necessary), your insurance card, your photo identification and your completed Maternal-Fetal Medicine Personal History form. If you are having genetic testing, you can also complete your Genetic Counseling form. Test results are typically available immediately. A physician with specialized training in maternal-fetal medicine will analyze and explain those results to you and share them with your obstetrician. We will communicate those results to you clearly and take as much time as necessary to address any concerns you may have. No question is too big or too small, so please don’t hesitate to ask. When considering where to have your baby, it’s important to know if and how your hospital is equipped to handle high-risk pregnancies and birth. Our neonatal intensive care unit (NICU) is prepared to handle high-risk mothers and newborns and ensure they will have access to high-quality care. We have nurtured some of the smallest, sickest babies back to health, giving guidance and hope to families during what can often feel overwhelming, exhausting, and stressful. 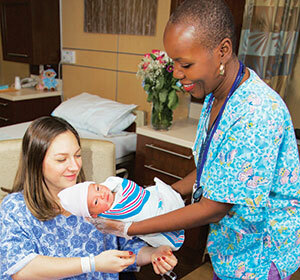 Schedule a tour of the maternity unit and meet some of your caregivers. Questions? Call 201-894-3499. Fill out your pre-registration form, available at your doctor’s office or at Englewood Health by calling Labor and Delivery Admissions at 201-894-3000, ext. 4115 or Admitting at 201-894-3015. To find a pediatrician, visit our online physician finder or call 833-234-2234. Please arrange to go to pre-admission testing (PAT) 2 days prior to your stay. Call 201-894-3655. Expectant parents can prepare in advance by watching the channel/programs at www.thenewbornchannelnow.com. The code is available upon request. Install your car seat three weeks prior to your due date. Have it checked by a certified child passenger tech (available by appointment through your local police station) or visit the National Highway Traffic Safety Administration website at www.nhtsa.gov. Familiarize yourself with how to adjust straps. Practice with a stuffed animal or doll, as you will need to be able to adjust the car seat independently prior to discharge from the hospital. The car seat should be less than 6 years old, in good condition, and should not have any add-ons that did not come with it initially. All parts should be attached and in good condition. Read your vehicle manual’s section on child restraints. The NHTSA recommends that car seats be replaced following a moderate or severe crash to ensure a continued high level of crash protection for child passengers. We recommend packing your “go-bag” three weeks ahead of your due date or when your nesting instinct begins to set in. You may want to keep the bag in your car. However, if you have items that are sensitive to hot or cold temperatures (e.g., cord blood collection kit), you will want to keep it inside near your door. Less is more. When it’s time to leave for the hospital, you’re going to want to be able to easily grab that bag and head right over. Going-home outfit for baby that is weather appropriate. We will medical necessities during your hospital stay. 1. You have strong, regular contractions. True labor pains become more intense and frequent over time. It may begin with what feels like menstrual cramps and later progress into sharp, distinct contractions happening between 10 minutes and one minute apart. 2. Your have severe back pain. We’re sure your back has been aching for a few months at this point, but there’s a noticeable difference when you’re in labor. Contractions may radiate from your back, creating an intense on and off sensation of pressure and pain. It’s not necessarily like what you’ve seen in the movies. Surprisingly, only one in 10 pregnant woman experience this prior to contractions. If your water does break, you may either experience a large gush, a small leak, or a combination of both. Remember to check: C (olor), O (dor), A (mount) and T (ime) because once your water breaks, it means your baby is susceptible to infections since the amniotic sac has been breached. This is another tricky symptom. As your cervix begins to dilate, the cervical plug may become dislodged in the form of a thick mucus or runny smear, and is usually clear, slightly pink, or blood-tinged in color. This can happen in conjunction with strong contractions. However, it is also not an immediate sign of labor. You can pass the cervical plug within days or even weeks before labor. Some women might not notice the loss of their cervical plug. 5. Soft bowel movements or diarrhea. Birth hormones send signals to your body to ready it for the birthing process but it can also cause frequent bowel movements and diarrhea. This information is not intended to replace the advice provided by your physician. If arriving between 11 p.m. and 6 a.m., please come in through the Emergency Department. At all other times, please enter through the main hospital entrance and someone at the information desk will assist you. Women who are scheduled for Caesarean section or induction of labor Monday – Friday should go to the 5th floor, Labor and Delivery Unit. On weekends, go to the 1st floor, Admitting Department. General visiting hours are 8 a.m. – 8 p.m., with special exceptions made for the Family Birth Place as detailed below. Up to two designated support persons are permitted with a laboring or delivered patient (exceptions may be made at the discretion of the charge nurse, patient care director, or physician). Siblings may visit; however, children other than siblings are not permitted to visit Labor & Delivery. No sibling who is sick or has recently been exposed to a contagious disease may visit. Children 12 years old or younger must have an adult, other than the labor coach, to supervise them at all times. Children must remain in their parent’s room or waiting area at all times. Parents who wish to have their other children in attendance during the delivery must arrange this in advance with their physician and the patient care director of Labor & Delivery. Parents assume the responsibility of preparing the child for the birthing experience. Grandparents who are not acting in the role of labor coach may visit if requested by the patient. At the discretion of the physician, one support person may attend the surgery. A staff member will bring guests to the L&D PACU for patient visits. The number of guests may be limited based on patient condition. One significant other, identified by wearing one of the four-part hospital ID bands, has unrestricted visiting hours and may stay overnight. In the Mother/Baby Unit, four guest passes will be allowed per patient. Siblings may visit; however, children other than siblings are not permitted to visit. Children (siblings) 12 years old or younger must have an adult, other than the mother, to supervise them at all times. Children must remain in their parent’s room or waiting area at all times. All guests must wash their hands thoroughly before contact with an infant. All guests (adults and siblings) must be free of illness or symptoms of illness. Parents can be present 24/7. All family/guests must enter through the main NICU entrance. All family/guests must wash hands (1-minute scrub) prior to visiting with infants. A parent must accompany any guest, and guests are to remain at the infant’s bedside. 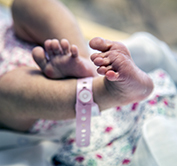 Siblings of the infant in the NICU may visit under the following conditions: a sibling screening form completed for each visit when the child is under 12 years old. You will need to complete the paperwork for obtaining a birth certificate prior to discharge. If you would like a Social Security card issued for the baby, please check the appropriate box on the form. If you are not naming the baby for religious or cultural reasons prior to discharge, we will have you contact the birth registrar at 201-894-3250. Mothers and babies will be encouraged to remain together throughout the hospital stay, including at night. Skin-to-skin contact will be encouraged as much as possible. We encourage families to be involved and participate as an integral part of the team caring for your baby. 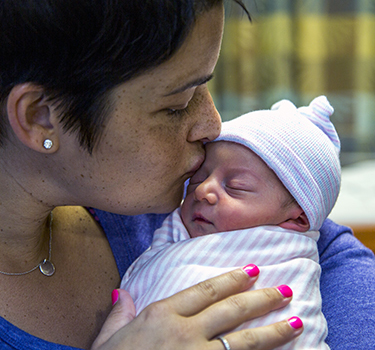 Parents are encouraged to practice skin-to-skin, or “kangaroo care,” which facilitates bonding and connection with their newborn. Child life specialists are available to help siblings adjust to a new family dynamic. Our relationship doesn’t end at discharge. The neonatal team will coordinate follow-up care with your pediatrician to provide complete continuity of care. In addition, premature and high-risk infants are followed by neonatologists in our High-Risk Neonatal Follow-Up Program to ensure babies receive all of the support, therapies, and services they may need for optimal infant development. Register online for our classes and events. Questions? Call 201-894-3499. 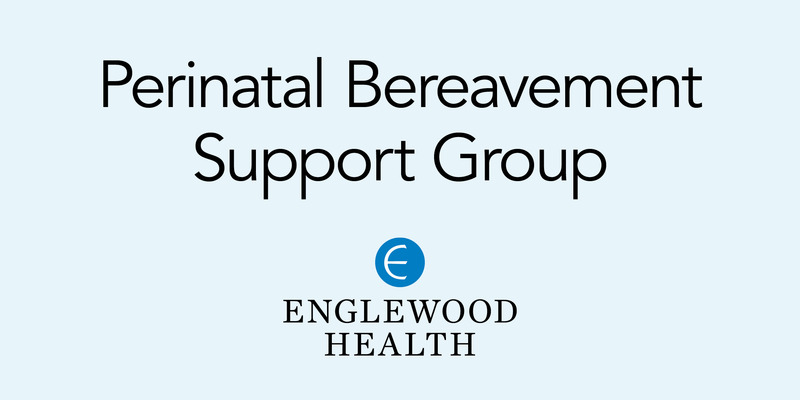 This five-week program includes childbirth education, a tour of the Family Birth Place, and one week of baby care basics; includes group consults by an Englewood Hospital and Medical Center pediatrician. Classes are offered Monday through Thursday. Three-week program, same as above in a more intensive format. Review of breathing and relaxation techniques and a tour of the Family Birth Place. This class covers the basics of breastfeeding, including latch and positioning, tips for pumping, and what to do when encountering problems like low milk production. Participants will also learn strategies for transitioning back to the work place. These seminars are designed to help you prepare for your new journey as a new or expectant parent. Topics include tips to improve lifestyle and diet, emergency prevention and management, child development, breast care education, and mental health. Learn valuable lifesaving techniques with a certified instructor. Offered Saturdays and Sundays at 1:30 p.m. Children ages 6 and up are welcome. Registration is required. Held daily. Ask your nurse for details. The Family Birth Place is committed to a warm, nurturing approach to educating parents about the benefits of breastfeeding and ensuring that a patient’s breast-feeding goals are met. We will support and assist patients with the goal of exclusive breastfeeding during your hospital stay. Per the recommendation of the American Academy of Pediatrics and the World Health Organization, healthy newborns require only breast milk in the first six months of life unless medically indicated. Breast milk is rich in nutrients and antibodies to protect your baby. It changes to fit your growing baby’s needs. Research shows breastfed babies have a lower risk of developing asthma, obesity, Type 1 and Type 2 diabetes, lower respiratory infections, childhood leukemia, and more. Studies have shown breastfeeding mothers have a lower risk of Type 2 diabetes and breast and ovarian cancers. Nursing staff are specially trained in assisting breastfeeding families and encouraging skin-to-skin contact with mothers after delivery to help promote bonding and breastfeeding. They will attempt to call mothers a few days after discharge to see how things are going and provide any additional support or information. International Board Certified Lactation Consultants (IBCLCs) assist breastfeeding mothers during their hospital stay and offer individualized teaching sessions in patient rooms. This is a designated help line for mothers to call with non-urgent breastfeeding questions and concerns. New moms can call 201-894-3354 after they have been discharged and a certified lactation consultant will return the call within 24 hours. A breastfeeding class is offered to expectant mothers during their pregnancy. 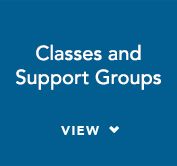 Information can be found in the “Classes and Support” section below. Many health plans now cover breastfeeding support and supplies. Please check with your individual insurance carrier prior to the delivery of your baby to see what services are covered. Hospital-grade electric breast pumps are available for use if needed during your hospital stay. To provide your baby with the safest discharge home, we ask that you bring your baby’s car seat to the hospital. We will perform a car seat fit test. This test will ensure the safe and proper placement of your infant in your car seat. Make sure that the car seat meets the recommended safety standards. Know the year in which your car seat was manufactured. Select an infant-only seat, or a convertible seat to be used rear-facing for infants. Infant-only seats are sold with 3 or 5-point harnesses. Both meet safety standards, but a 5-point harness is preferable. Always read your car seat manual and your motor vehicle car seat installation manual prior to use. Positioning inserts or items not sold with the original car seat (after-market products) should be avoided. These products are not tested with the car seat and may cause failure of the car seat. The baby may only wear a light sweater/light jacket while in the car set. Blankets may be placed over the baby but NOT under the car seat straps. Heavy jackets should be removed before putting the infant in the car seat to ensure that the straps hug, but not squeeze, the baby. The harness straps should hug, but not squeeze, your baby. Always refer to the car seat manual to ensure proper fit. Used car seats should not be used if the car seat is more than 6 years old. All car seats must be checked for recalls. Check recalls at carseat.org or www.safekids.org or by phone: 1-800-745-SAFE. If your baby was born earlier than 37 weeks, the baby will undergo a car seat “challenge” test prior to discharge. The challenge is intended to test the baby’s ability to sustain an upright position. This “challenge” is not a guarantee of the baby’s safe travel. We look forward to assisting you and your family with a safe transition home. Always place your baby on his/her back for sleep times, both naps and at night. Back sleeping has been shown to reduce the risk of sudden infant death syndrome (SIDS), the sudden, unexplained death of a baby younger than 1 year of age. SIDS is the leading cause of death in babies 1 month to 1 year of age, with most SIDS deaths happening between 1 – 4 months of age (See safetosleep.nichd.nih.gov). Babies who sleep on their backs are much less likely to die of SIDS than are babies who sleep on their stomachs or sides. The sleep surface (crib/bassinet) that your baby sleeps on should be firm and should not have any bumpers, pillows, blankets quilts, sheepskins, loose bedding or soft toys in it. Your baby should not sleep in an adult bed, on a couch, or on a chair alone, with you or with anyone else. If you bring your baby into your bed to feed, make sure to put him or her back in a separate sleep area, such as a safety-approved crib or bassinet. For information on crib safety, contact the Consumer Product Safety Commission. Strangulation, when something presses on or wraps around baby’s neck, blocking a baby’s airway. Keeping your baby’s sleep area in the same room where you sleep has been found to reduce the risk of SIDS and other sleep-related causes of infant death. 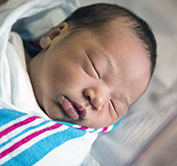 Preterm babies sleep longer than full-term babies. Their sleep is characterized by much motor activity. On average, preterm babies spend approximately 80% of their sleeping time in the more disorganized state of active sleep compared with full-term babies, who spend 50% of their overall sleeping time in quiet sleep (deep sleep). Periods of quiet alertness are brief and sporadic in preterm babies. The ability to maintain periods of quiet alertness is a high-level task for premature babies. Good quality alertness increases closer to term. Babies continually transition from state to state. They have a range of six levels of alertness: quiet sleep, active sleep (preemies spend most of their time in this state), drowsy, crying/fuss, quiet alert and active alert. Your baby may signal changing states by crying or going from sleep to drowsy to quiet alert. The Family Birth Place has been recognized for medical excellence and patient safety for its maternity care. Our Antepartum Testing Center is accredited by the American Institute of Ultrasound Medicine and our Neonatal Intensive Care Unit has been designated with the highest level available to a community hospital. We have also earned recognition by Comparion Analytics/CareChex and Healthgrades. Designed with families in mind, the Family Birth Place at Englewood Hospital and Medical Center offers amenities reflective of a 5-star hotel but with the safety and experience of medical specialists, advanced technology, and services you expect at a big hospital right at your community medical center.